I think I was about ten years old when grapefruits first appeared in our grocery stores. Nobody knew exactly what they were but the rumor had it they were a hybrid of orange and lemon. Since beside those two the only other citrus known to the population was mandarin, the information didn’t seem all that absurd. Masses hadn’t appreciated the novelty: even though it was bigger than an average orange it was too bitter. The idea to peel each wedge didn’t occur to people at first and once it did seemed like too much work. Fruits were scarce and expensive and there were hardly any I didn’t like. 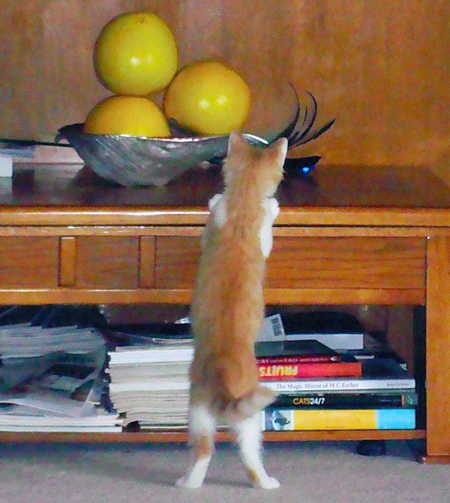 So I liked grapefruits as well. Since then I’ve tried many more different varieties of citrus including grapefruit’s real parent pomelo but grapefruit is still one of my favorite fruits and I enjoy it in many forms. This is a perfume blog so I’ll start with the perfume-related part (though for whatever reason – holidays? – my thoughts are all over the place). Grapefruit is a popular note in both supporting and leading roles so I am not trying to cover even all grapefruit perfumes that I’ve ever tested and still have samples of but will mention only several in-you-face grapefruit fragrances that I liked the most. 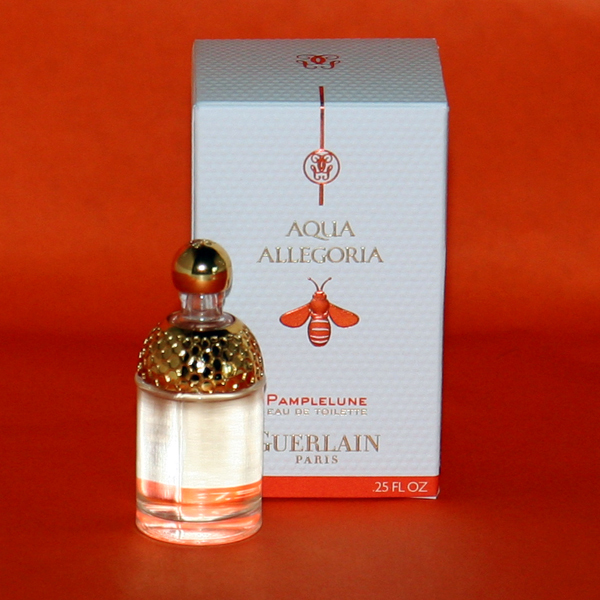 Aqua Allegoria Pamplelune by Guerlain is probably one of the best-known grapefruit perfumes. If you want a real review, I suggest reading Suzanna’s (Bois de Jasmine) five-star rated review. 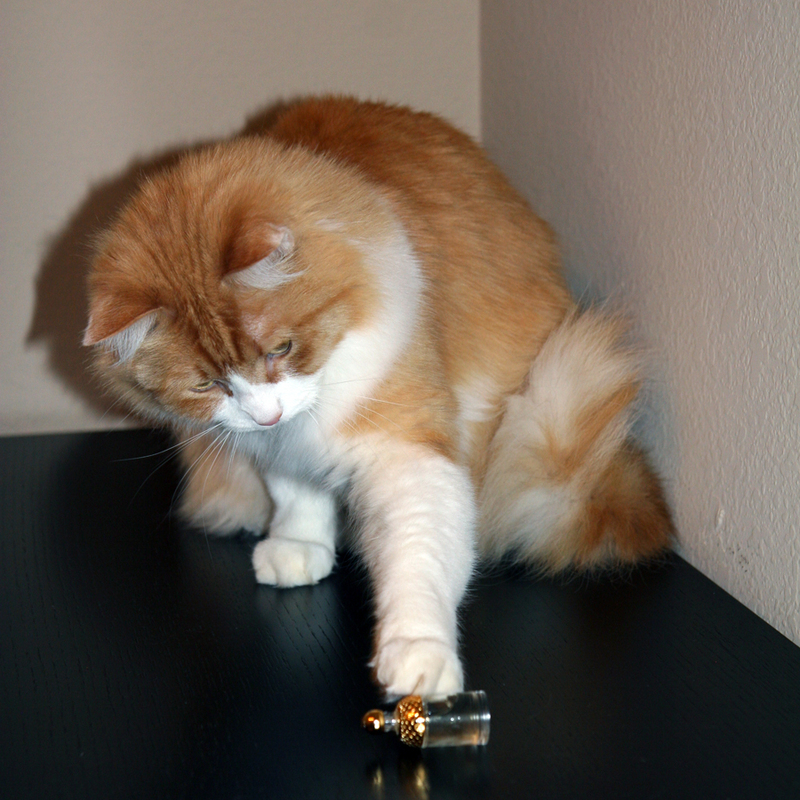 If you’re familiar with the perfume, I recommend reading Vanessa’s (Bonkers about Perfume) post Bonkers “In Edinburgh”: The Guerlain Pamplelune Sniff-Off And A Bid To Rescue Birgit’s Grapefruit Scent Squeeze – just for laughs. I like Pamplelune and two mini bottles will satisfy my grapefruit cravings for a while. Once they are gone I suspect I’ll want more. Not surprisingly, Grapefruit by Jo Malone is the second perfume that comes into the conversation every time somebody raises the topic of perfumes with the homonymous note. Gaia (The non-Blonde) in her review was even more generous towards this perfume than I would have been: I think it’s nice but not interesting enough to tolerate the usual Jo Malone perfumes’ vanishing act and too expensive to use it in, again, usual for the brand’s DIY layering games. But I love Jo Malone’s Grapefruit Body & Hand Wash Gel. My travel-sized bottle is gone so now I’m thinking about buying the real bottle. I do not like the price but I enjoyed taking showers with that gel so much that I might just take the plunge. JM Grapefruit‘s half-sibling, Pomelo by Jo Loves… (same perfumer but different brand and relations become even murkier if to consider fruits themselves), starts like a juicy grapefruit (well, technically pomelo but those two are close enough) but the drydown on my skin is very similar to the older brother’s one. And with an even higher sticker price this one isn’t making it into my collection. For real review of Jo Loves… Pomelo read Lucas’ (Chemist in the Bottle) post. Another half-sibling, Assam & Grapefruit by Jo Malone (same brand but different perfumer), much more subtle with grapefruit, was a limited edition a couple of years ago (it’s still available online) so even though I have a bottle of it and wear it in summer from time to time, I don’t think it’s special enough to recommend hunting for it. Eau de Pamplemousse Rose by Hermès in its opening is an unmistakably grapefruit perfume. Every time I try it, for the first couple of minutes I have to hold myself from leaking my wrist – so believable Eau de Pamplemousse Rose smells of sweet and juicy grapefruit! But then it dries down to a floral skin scent. It’s pleasant but the only reason I might go for a small bottle is because I like those colored bottles from the line. Birgit (Olfactoria’s Travels) thinks that Eau de Pamplemousse Rose can be trusted to revive the spirits, even if the rain keeps falling. I’m not a tea connoisseur (so if you are please disregard this part of my post) but I like tea and throughout the years I found different teas that I enjoy drinking. One of such teas is Lupicia Grapefruit Green tea. It’s very fragrant and has a very believable grapefruit smell. I bought this tea more than once which I do only with teas that I really liked – otherwise I just move on. Several years ago at Out The Door restaurant in San Francisco I ate Jicama and Grapefruit Salad with Red Cabbage, Candied Pecans and Sweet Soy Dressing salad. It was created by a known master chef Charles Phan (Slanted Door). I liked it and started making a variation of it at home. You can simplify the preparation by buying candied pecans instead of making your own. I found a blog with detailed instructions and pictures for this salad, so I won’t reproduce it here but rather give you a link.